In 1909, Michio Suzuki started a factory of looms for the textile industry. It turns out to be a good business and in the following decades the Suzuki Loom Works becomes a major company. Plans to conquer the car market fails due to the outbreak of World War II because cars were according to the Japanese government "not essential". In the first years after the war, the company continues as before. As the cotton market collapses in 1951, they were forced to look for something different than looms. Again their interest goes towards a motorized vehicle. According to the story, Michio’s his son Shunzo, who was cycling home after a day of fishing, got the idea of a motorized bicycle. Whether this story is true or not, his idea is certainly not original. 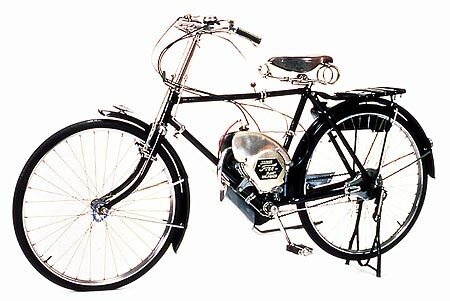 What certainly is true is that Suzuki - like several other Japanese companies at the time - comes up with an engine that can be attached to a bicycle. Soon also the first complete assembled "motor-assisted bicycle" of the brand comes on the market: the Power Free.